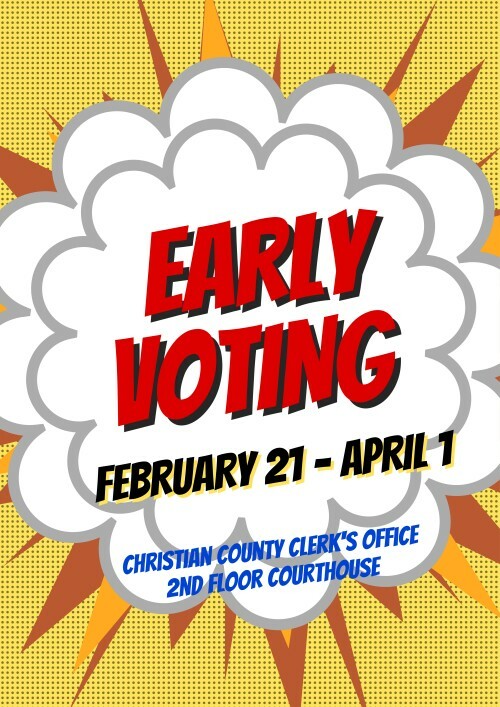 The Christian County Clerk’s Office, located on the 2nd floor of the County Courthouse, 101 S. Main St., Taylorville, is the only location for Early Voting within Christian County. The Courthouse is an accessible facility. Early Voting begins Thursday, February 21, 2019, and runs through Monday, April 1, 2019. Office hours are Monday through Friday, 8:00 a.m. until 4:00 p.m. Saturday voting will also be available from 9:00 a.m. until 1:00 p.m. on March 23 and March 30, 2019. Any otherwise qualified voter may choose to vote early at the Clerk’s Office. Qualified registered voters may also request to have their ballot mailed to them. The postage required to return the ballot is $1.15. Call the Clerk’s Office at 217-824-4969 with any questions about voting, requesting an absentee ballot, or to verify your current registration status.